The Maremmana breed is a descendent of the bos Taurus Macroceros, a longhorned cattle that spread from the Eurasian steppes throughout Europe and that, in Italy, can be traced as far back as the Etruscan era, as evinced by the archeological findings from Caere (modern-day Cerveteri) and by the taurine head from the Vetulonia museum. 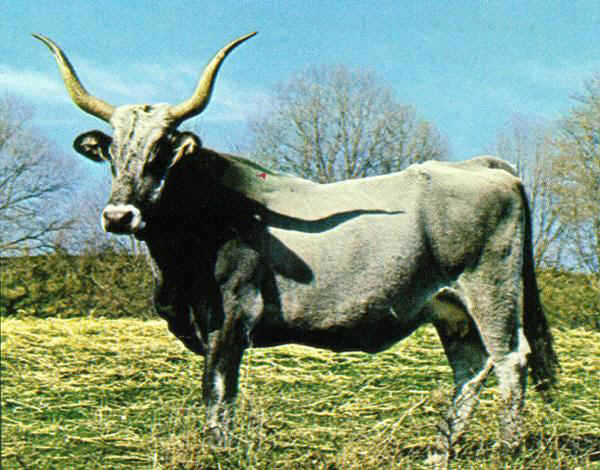 This cattle (the bos Silvestris described by Pliny in his Natural History) was crossed with the Podolica cattle that reached Italy following the barbarian invasions, giving rise to the Maremmana breed which populated in enormous herds and has been a distinguishing feature of the marshy malarial zones of the Maremma areas in Tuscany and Latium. Maremmana breeders were exported from these areas to various regions and countries. The Grand Dukes of Tuscany sent breeders .from their holdings to Hungary to reinvigorate the Pustza breed. With the progressive reclamation of the marshlands, the breed underwent notable impetus between the First and Second World Wars; thanks to intensive selection work. After World War II a period marked by agricultural mechanization and farming reform, the breed decreased greatly in number. Added to this was the negative impact of replacement crossbreeding, which further decreased the number of bead as far as purity is concerned. Despite these events, the situation has been changing over the past few years. The Maremmana breed is reasserting its perfect suitability to the habitat that shaped it, populating areas that bad previously been off-limits. The breed is currently spread throughout the provinces of Grosseto, Viterbo, Rome, Terni, Latina, Pisa, Leghorn and Arezzo. The interest aroused by this breed has become even more intense lately; not only among certain breeders in southern Italy, but also among foreign breeders, particularly in Spain and Central America, who find that the Maremmana is the ideal means to make the most of particularly harsh environments. This breed is widespread in Tuscany and Latium and as about 5000 head enrolled in the Herd Book. the Maremmana has a gray coat that is darker in males and lighter-colored in females, with blank apical pigmentation. As seen in other breeds of Podolica descent, calves are wheat-colored at birth and then at around three months they turn to the characteristic color of the breed. The horns are long and have typical half-moon shape in the males, whereas the females have lyre-shaped horns. The Maremmana has an impressive skeletal structure that gives the adult a very solid and robust appearence. This very large sized cattle has extremely solid legs, exceptionally hard hovves and, in general, perfect perpendicularity. 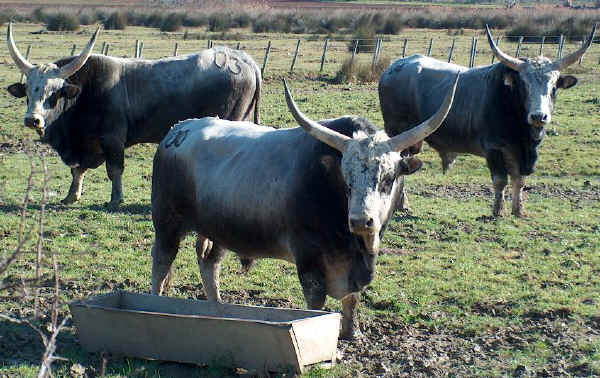 Very rustic cattle characterized by solidity, skeletal strength and good muscle tone. The cows have a well-shaped udder and an abundant supply of milk that ensures daily weight gains of over 1 kg of the calves. The maremmana is an extraordinarily rustic and long-lived breed that can reach an age of 15-16 years. Calving is spontaneous and the calves weigh 30-40 kg at birth. They reach a weight of 180-220 kgs by the age of six months, thus confirming the cow's milk-producing capacity.